Widnes ended a tumultuous week with a morale-boosting 44-22 win over Featherstone Rovers in front of almost 6,000 fans at Halton Stadium. 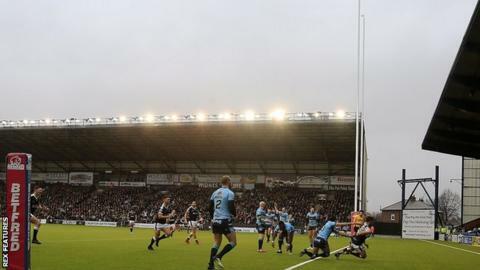 The Championship club were saved from liquidation after a consortium's takeover was approved by the Rugby Football League. Widnes issued a statement following the game, thanking fans for turning up, especially in wet and cold conditions. "Without this backing, today would not have been possible," it said. "To see fans queuing up in the pouring rain outside the South Stand, and seeing the Pat Price Stand sold out, was an incredible sight. "To have almost 6,000 supporters inside the ground just days after the club fought off liquidation was the inspiration the players needed as they entered the field. If we are to be successful in 2019, we need you backing us every step of the way." The Vikings ran in eight tries in the victory, including two each from Ryan Ince and Jack Owens, who also kicked six goals, while Harry Newman scored two for Rovers. New private limited company Widnes Rugby League Club Limited has taken over control of the club, after fans began a fundraising campaign, which raised more than £100,000 in support. The seven-time Challenge Cup winners will still receive a 12-point penalty for going into administration.